Note: for security purposes I have not posted any photos of the exteriour of the Thru the Bible offices or the female staff. 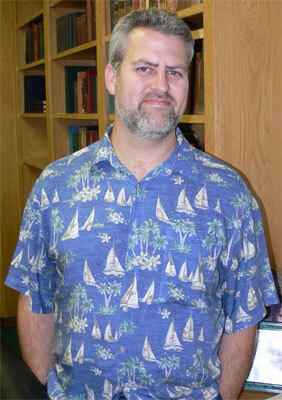 Michael Cordick, the script writter for all Thru the Bible announcements. Michael also conducted our tour. 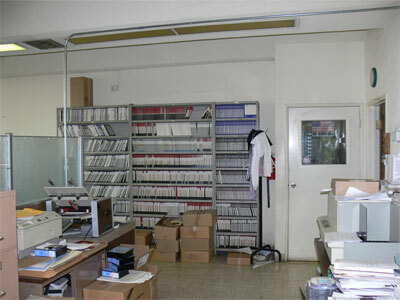 The TTB offices. The total staff is about 17 people. The Ampex 620 reel to reel tape recorder that Dr. McGee made all his recordings on. We still benefit today from the superb quality of this donated tape recorder. 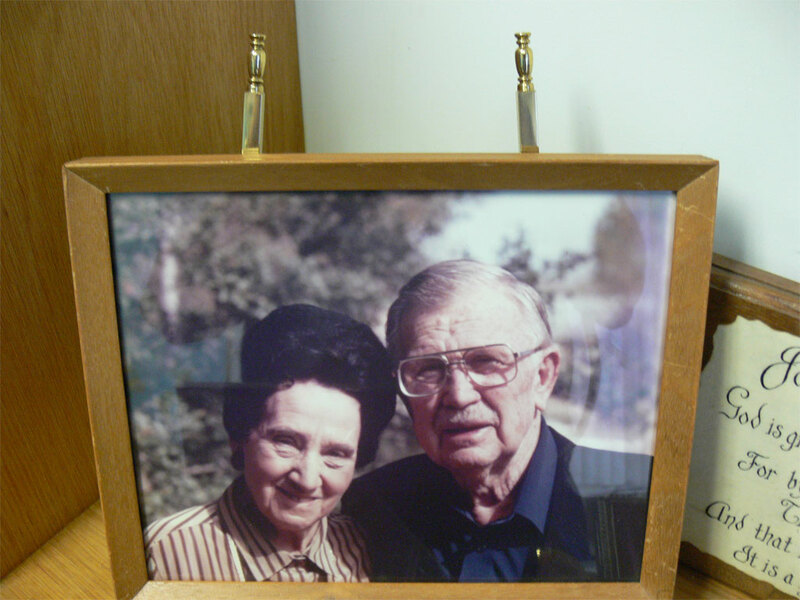 Recent photo of Dr. McGee and his wife shortly before his passing. 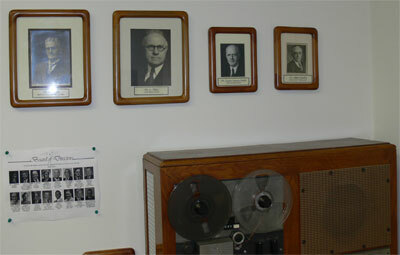 The wall of Dr. McGee's four mentors. He often spoke of these men in his sermons and their influence on his life. 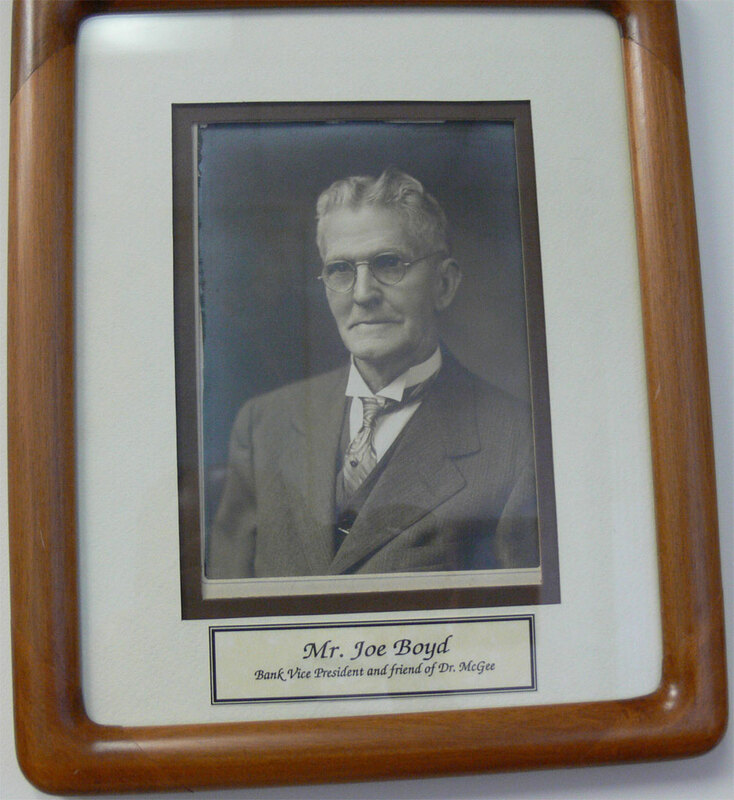 Mr. Joe Boyd, the bank manager who Dr. McGee worked for a as a student. 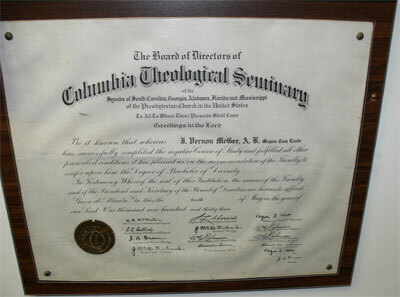 He bankrolled Dr. McGee's entire education thru seminary, when he didn’t have a penny to his name. 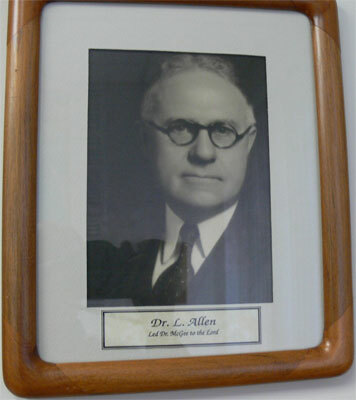 Dr. L. Allen, who led Dr. McGee to the lord as a teenager, and was also his pastor, I believe. Dr. Lewis Sperry Chafer of Dallas theological Seminary, where Dr. McGee studied. 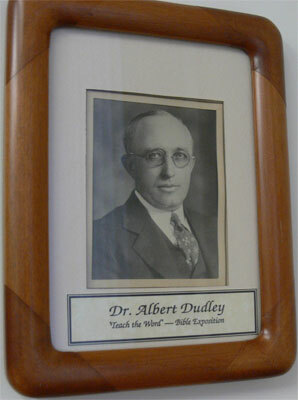 Dr. Albert Dudley who shared his vision of preaching the Word, which became Dr. McGee's life passion. 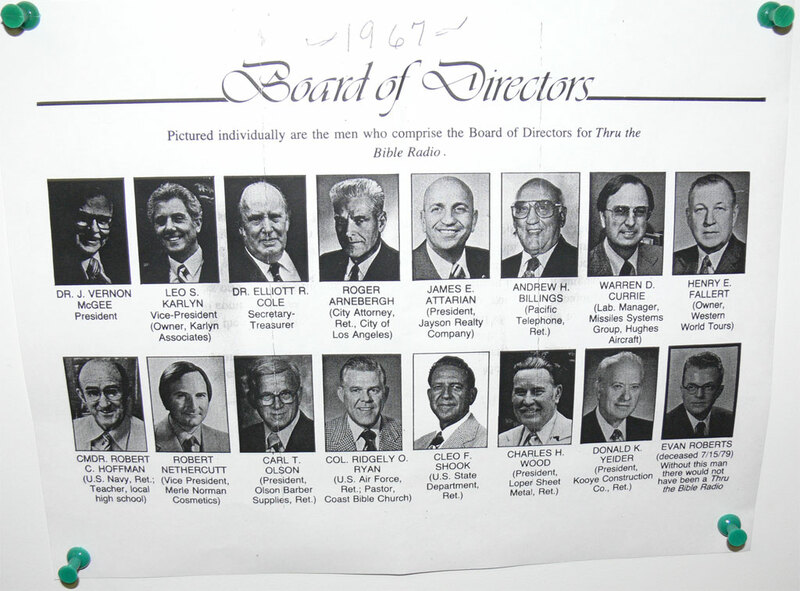 Board of Directors, 1967, of TTB. Without Evan Roberts, the man on the bottom right, there would not be a Thru the Bible Radio Network. Master of Theology from Dallas Theological Seminary. 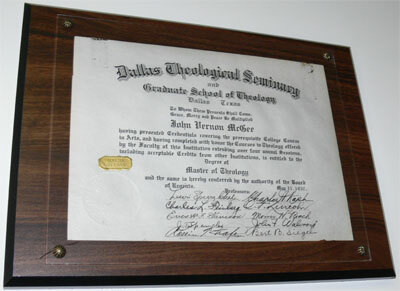 We later visited Dallas Seminary, where Dr. McGee is still one of their most cellebrated allumni. Trans World Radio International Broadcasting Award. My parents served with Trans World Radio in Bonaire, Neth. Antilles, for 11 years. I was with them for six of those years. 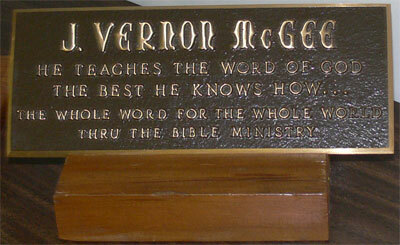 Summary of Dr. McGee's Ministry: "He Teached the Word of God the best he knows how." The slogan of TTB: "The whole Word for the whole world." The mail room. Minas, in the back, takes care of the financial mail. The gentleman in the foreground maintains the data server and the back ups. Dr. McGee’s original pulpit which he preached from at Church of the Open Door. 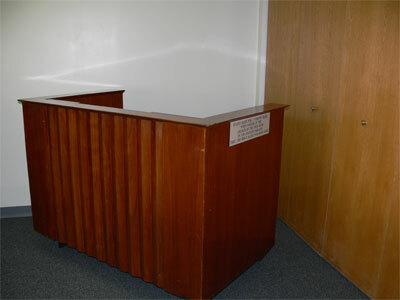 The pulpit was donated to Dr. McGee just before they tore down the building. 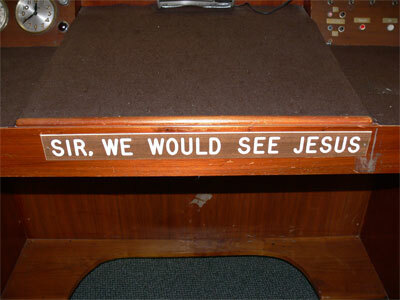 Sir, we would see Jesus. 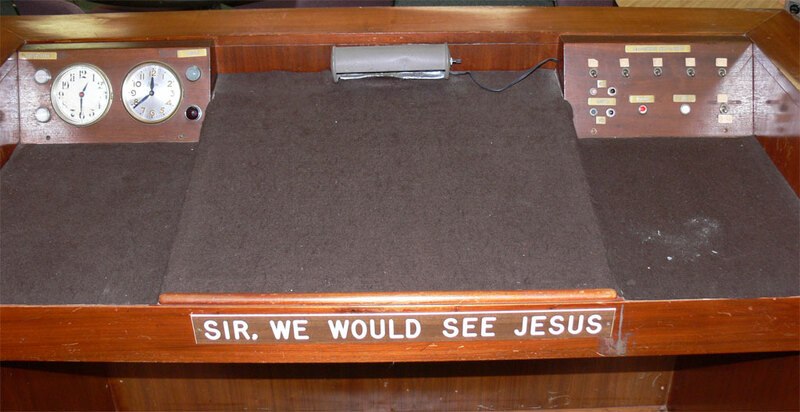 This is the first thing that visiting pastors would see as they entered the pulpit. Timing was critical, so clocks were installed right in the pulpit. The overall layout of the pulpit was huge to allow room for the many reference books Dr. McGee used. 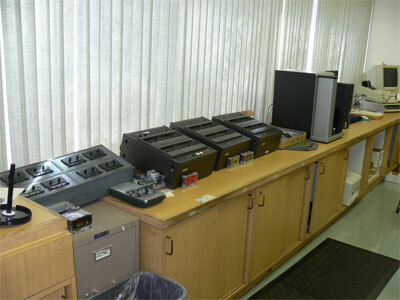 Cassette duplicators. Not used very much today. Audio editing. They use Adobe Audition. Nestor Fabian, the audio technician for TTB. I've been working with Nestor for years by email and over the phone, and was finally able to meet him. 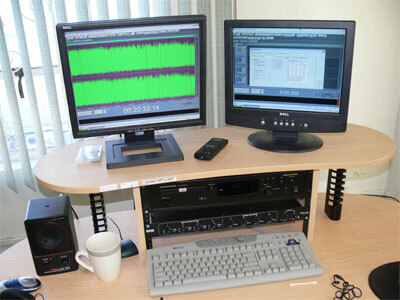 Nestor's computers and audio equipement. 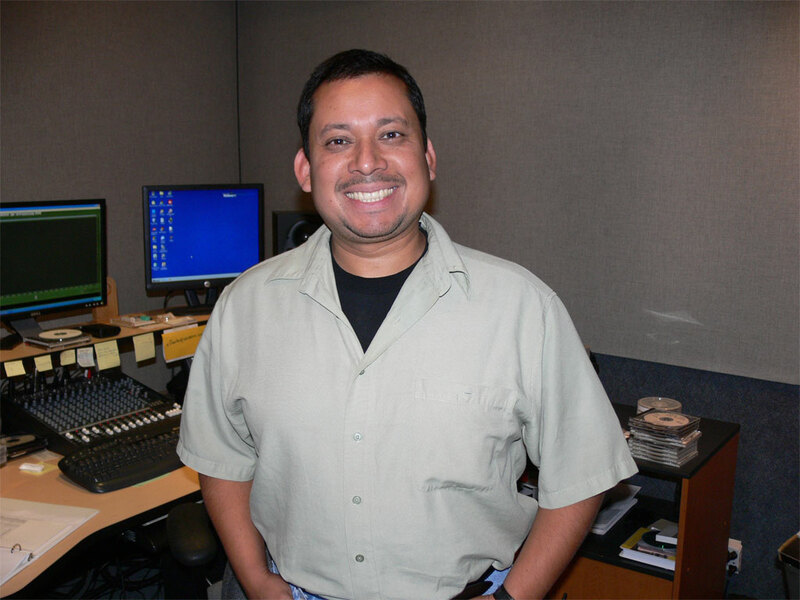 He splices all the announcments into the daily programs and uploads them to all the satelites and radio stations. 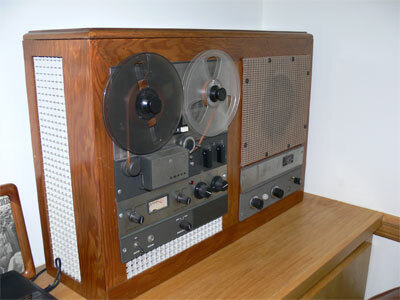 Nestor's reel to reel. Once in a while a digital file is corrupted and he take the original reel to reel and recreated the digital file. The reels are first "cooked" to get rid of the moisture and then put on the machine here. 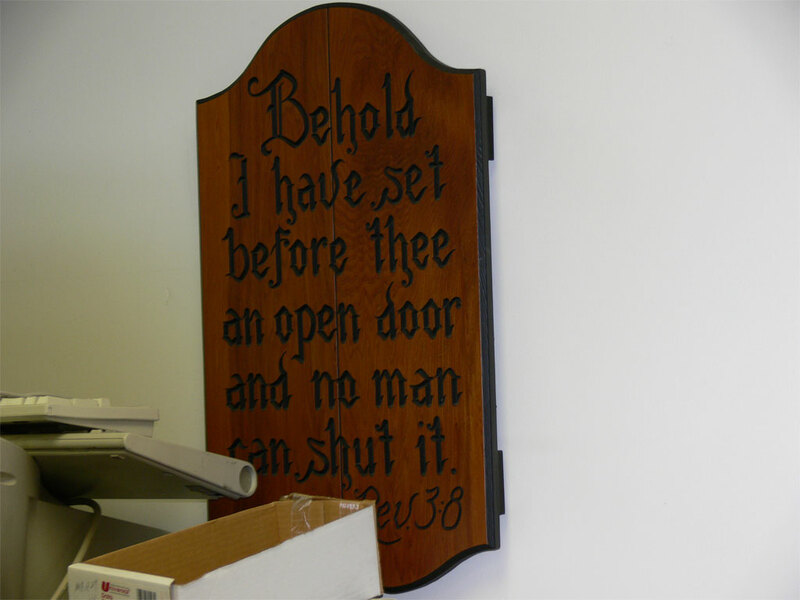 Wall plaque from Rev. 3:8. Dr. McGee used this verse to perserveer when times were tough. 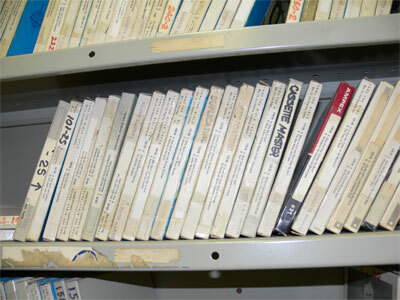 Reel to reel archives of all of Dr. McGee's messages. Only 40% of these are digatized. Only five years of these Sunday Sermons are available online. 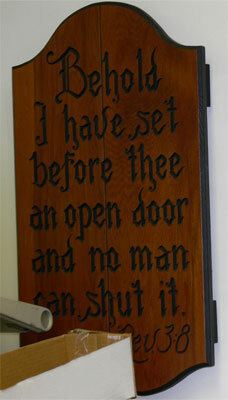 There are 22 years of Sunday Sermons from the church of the Open Door stored here. 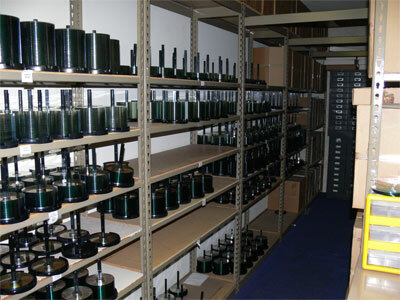 These reel to reel archives are stored in another warehouse near the main office. Who will digatize this treasure trove of God's teaching? Ancient labeling equipement for CDs? 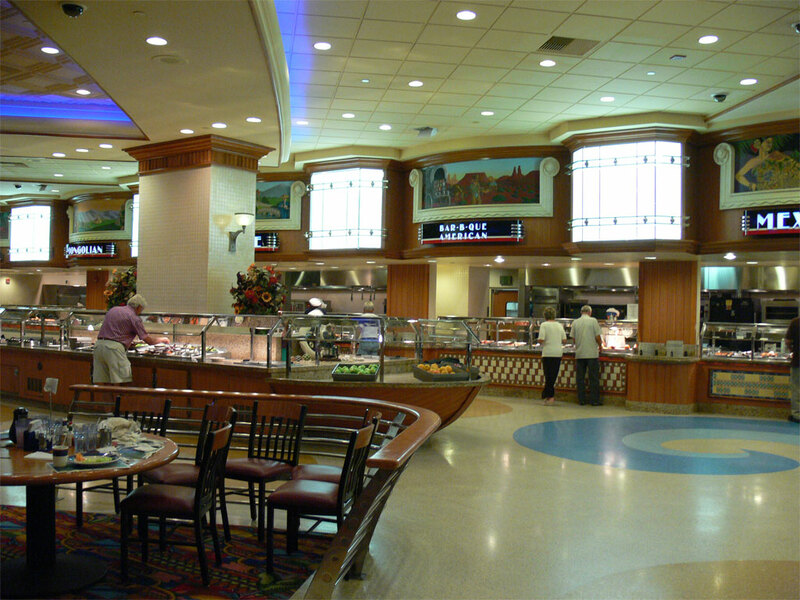 Inside the Gold Coast casino, a huge buffet with different themes by six different countries. One-armed bandits everywhere. Evrywhere you go there is this hypnotic music playing in the background. Note: I didn't use flash in any of these photos in order not to disturb anyone. Off-track horse racing. Dozens of ways to go broke. 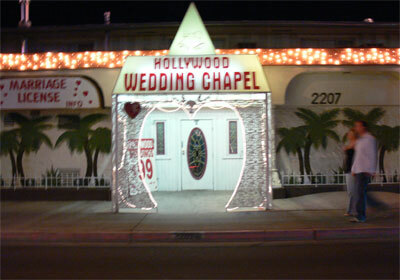 Hollywood Wedding Chapel. Instant everything. Eygtian Pyramid and Sphinx in Los Vegas. The centre light was a spot light that shone far up in the night sky. 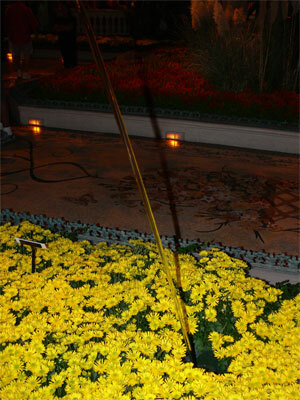 Inside The Bellagio Hotel, where we parked, a solid hoop of water forms an archway over path. It is not inside a tube but simply freeflowing through the air. People were nervous to walk underneath of it. The arch of water seemed to disappear into the ground. Suddenly, it stopped for a minute with no splash at all. Then it reappeared. Beautiful! 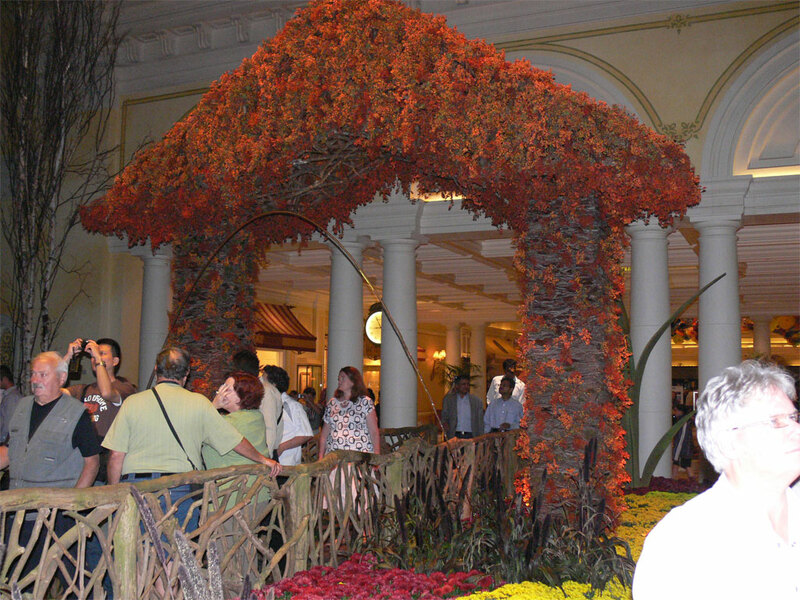 Thanksgiving display of a harvest gargoil in the form of a human tree. 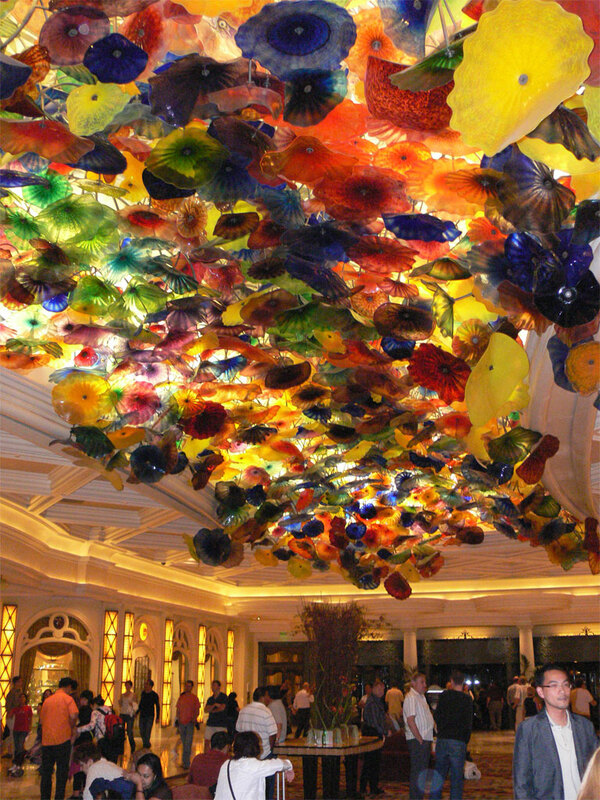 On leaving The Bellagio, the ceiling was covered with glass flowers. 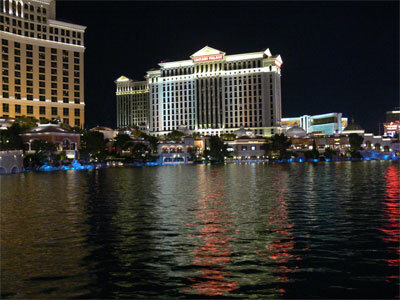 Directly in front of the Bellagio, there was spectacular light, water and music show. The water shot a hundred feet in the air, all in time to the music. The man-made lake that the fountain was held in was huge. 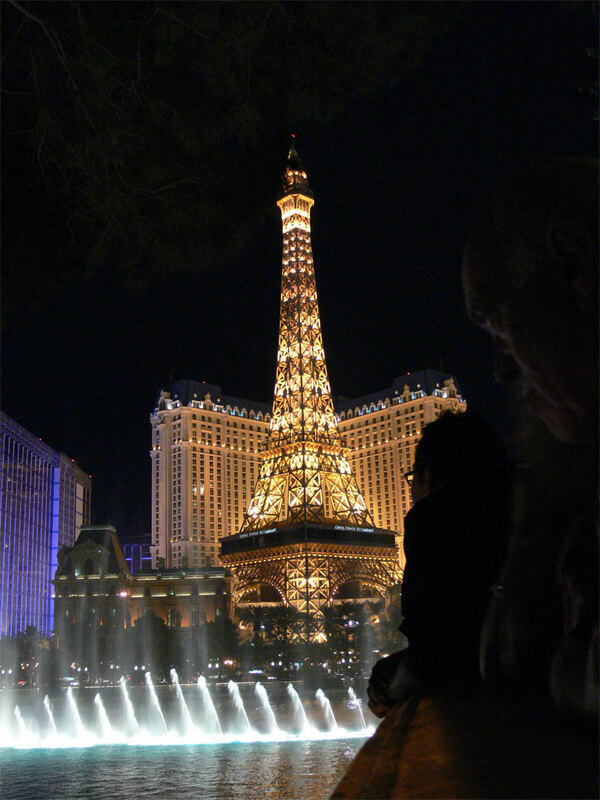 The Eiffel tower was almost more beautiful than the real thing in Paris, although not a big. 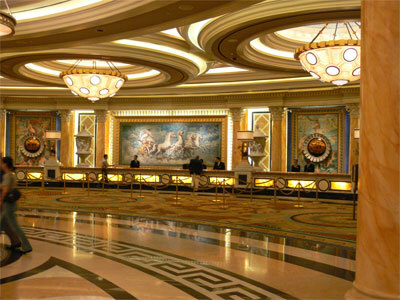 Lobby of Caesars Palace. It looked a lot like a palace. Just for fun we went up to the counter and asked how much a room would be. 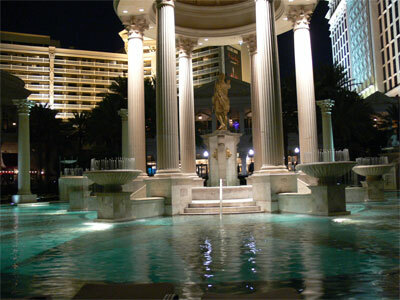 Towards the back of the complex was a stunning fountain with a statue of Caesar in the middle. Nothing was gaudy, but very elegant. Friend of Caesar. This statue was just inside the front door. Today is the day I’ve been waiting for during this entire trip! We have a 10:30 meeting scheduled with Leo Karlyn, President of Thru the Bible Radio Network in Pasadena, California. I will finally be able to meet the staff I have been working with for the past several years! It is my goal today to try to expedite the mp3 publication of the Sunday Sermons by Dr. McGee. I have long considered the collection of the Sermons he delivered at the Church of the Open Door during his 21-year pastorate to be a fantastic treasure trove of dynamic Bible teaching. While they have already agreed to release the entire five-year series of Sunday Sermons on line in mp3 format, it has not yet happened, and I hope to be able to volunteer to assist in this grand project in some way. 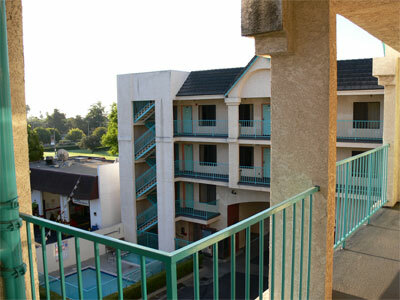 We are on the fourth floor of our hotel, overlooking the City of Pasadena. There are palm trees as far as I could see which always thrills me. 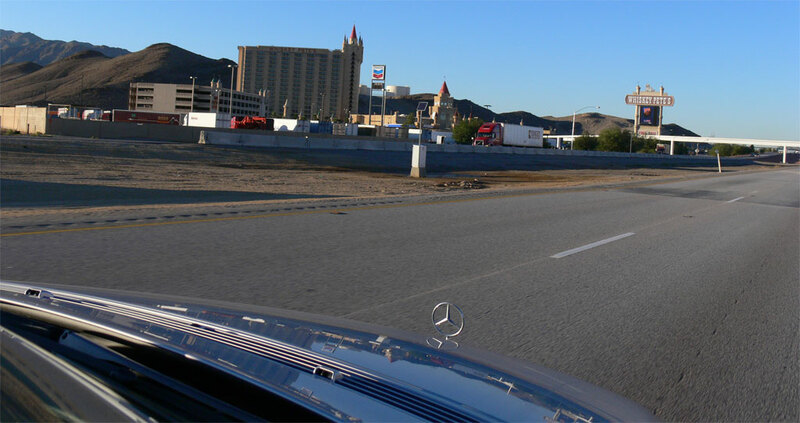 It seems Pasadena is a fairly clean and prosperous city, with many palm tree-lined streets. Directly across the road from our hotel is Pasadena City College, which appears more like a small university. We are not far away from the Thru the Bible office. After breakfast, and a bit of journaling on my computer, we left around 10:00 for the office. 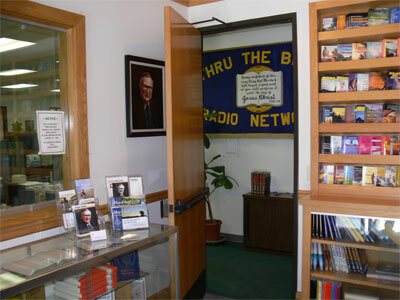 When we reached the corner that the GPS said was their office, we saw no signs indicating Thru the Bible Radio Network. I ended up having to go around the block again, and parked on the side of the street in order to investigate on foot. We approached a building right on the corner of a mixed residential and business street, and noticed that the number on the door matched what Bob Kern had emailed me. However, the glass was tinted, and I could not see in. When I tried the door, I found it locked. I pressed the buzzer, and it promptly unlocked for us. As soon as opened the door, I knew I was in the right place. 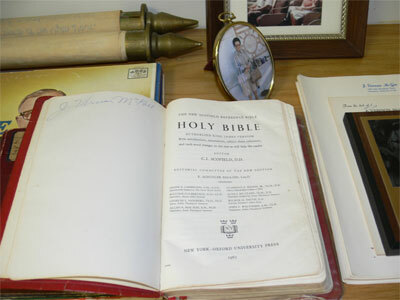 In the small lobby, there was a glass bookcase with an open Bible on top. 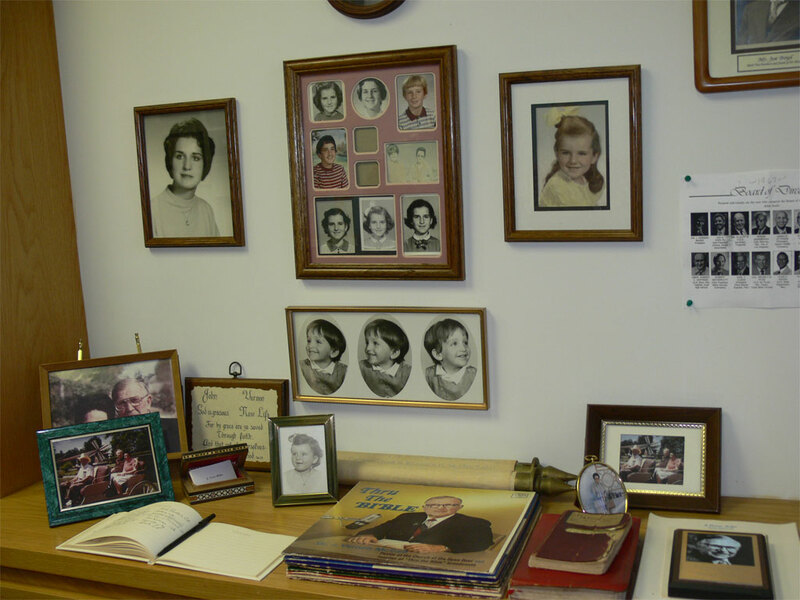 Dr. McGee’s picture was in several places, and Thru the Bible literature was all over the walls. There was no receptionist at the front desk, but a gentleman approached me from the back office. His name was Michael Cordick, who I believe was the production manager. As he quickly pointed out, everyone in the office wears multiple hats, and at one point or another, each of them seems to do almost all of the tasks in the office. 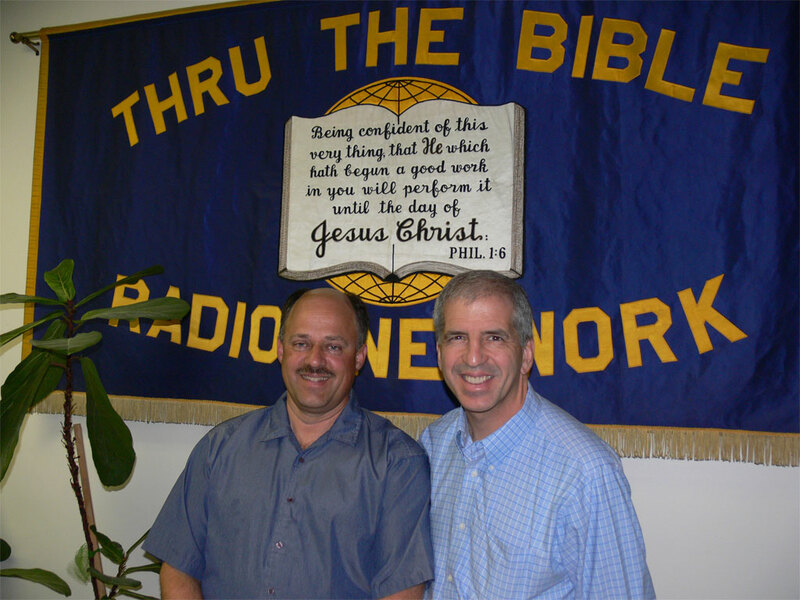 What I considered most important was the fact that Michael was the script writer for the announcements on Thru the Bible. He said he spends about two days a week creating scripts, which are sent to Steve Shwetz to be read in. The audio is then mailed back via CD. 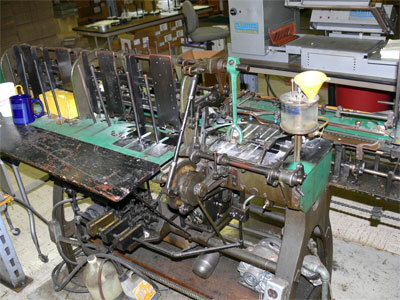 These are spliced electronically onto the start and finish of each Thru the Bible broadcast. I believe they work about two to three months ahead. The first place Michael took me to was Dr. McGee’s old office. On the desk was the nameplate, “J. 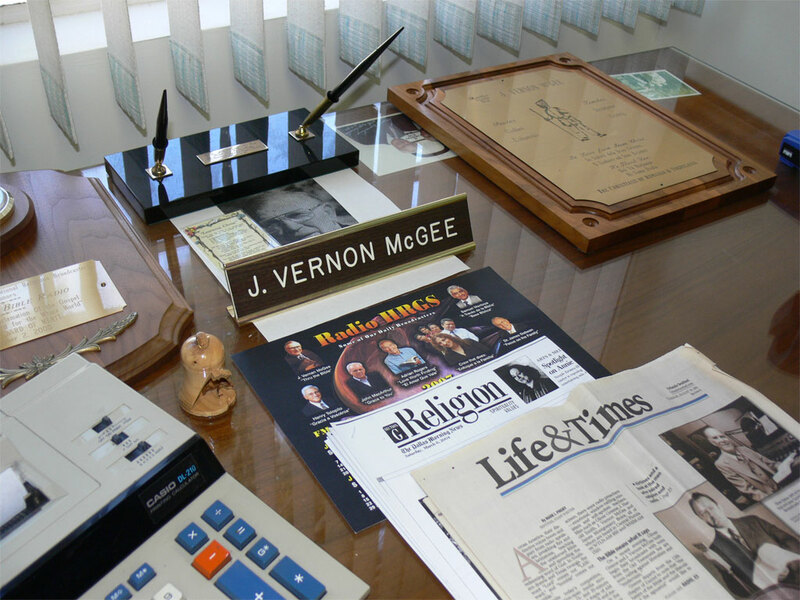 Vernon McGee.” On the wall to the left of his desk was a huge reel-to-reel AMPEX recorder. This was one of two identical audio recorders on which Dr. McGee recorded his entire five-year Thru the Bible series. I believe the other machine was located at his home, or sometimes moved to his desert cottage, where he did all the recording himself. Dr. McGee’s desk faced the window, which I noticed had bars on it. In fact, I noticed all the windows in this building had bars on them, and all the doors were locked. Apparently, a sister ministry, Focus on the Family, experienced an armed robbery a while ago in the same area the city, so they have tightened up security considerably. There have been no over-the-counter-sales from this office. Everything is downloaded online, or shipped via the post office. 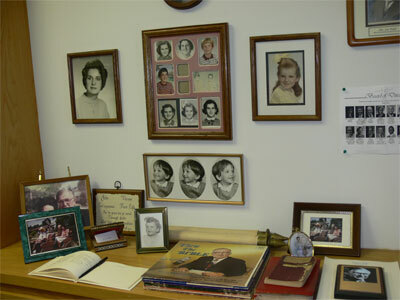 A bulletin board with the pictures of Dr. McGee’s wife and daughter hung on the wall on the left side of the room. At the top right of this, within view of his desk, were pictures of the four men who had the most influence on Dr. Magee's life. Michael pressed play on a cassette recorder, and we listened to Dr. McGee refer to these four men in one of his messages. 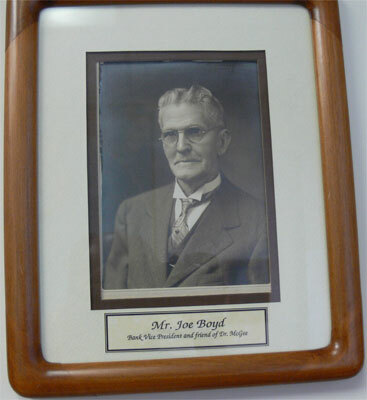 The first was Mr. Joe Boyd, the bank manager who Dr. McGee worked for a as a student. 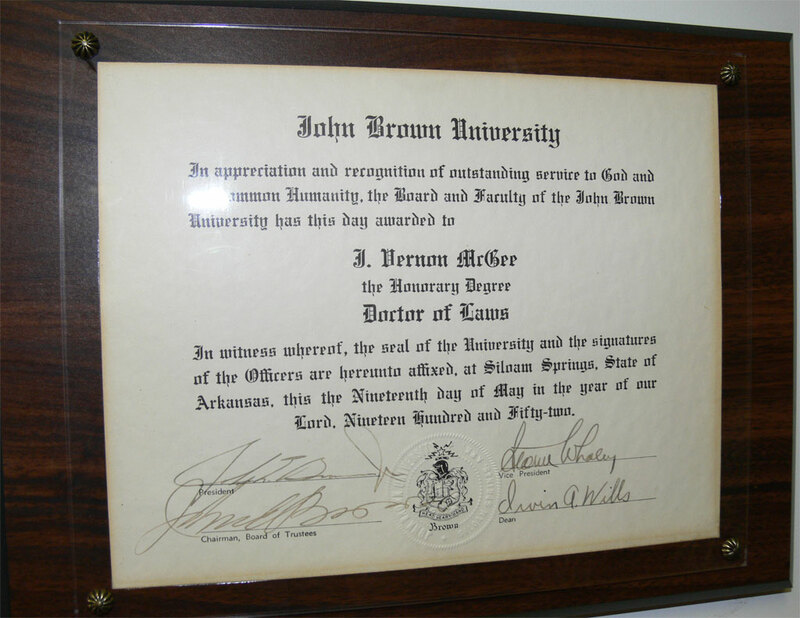 He bankrolled Dr. McGee's entire education thru seminary, when he didn’t have a penny to his name. 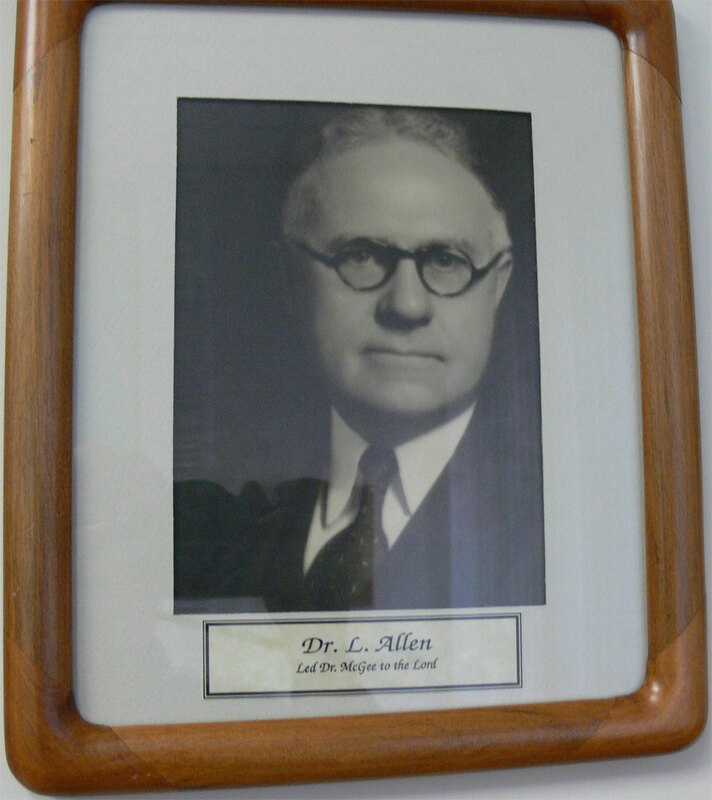 The second was Dr. L. Allen, who led Dr. McGee to the lord as a teenager, and was also his pastor, I believe. 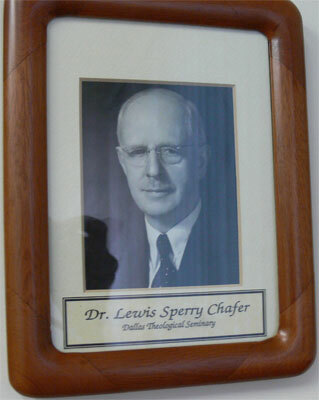 The third was Dr. Lewis Sperry Chafer of Dallas theological Seminary, where Dr. McGee studied. The fourth was Dr. Albert Dudley who shared his vision of preaching the Word, which became Dr. McGee's life passion. It was a very special feeling to be in standing in the room and at the desk of Dr. McGee who taught this incomparable five-year series of Bible teaching. 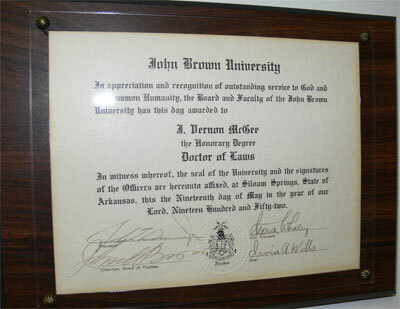 Just outside Dr. McGee's office, a whole series of plaques were displayed on a wall. I immediately recognized the picture of Dr. 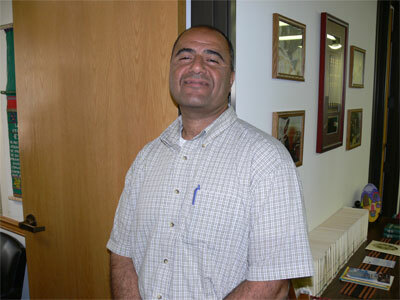 Freed, founder of Trans World Radio. My parents were missionaries with Dr. Freed’s ministry for 11 years on Bonaire, Neth. Antilles. It was Dr. Freed who inspired Dr. McGee to expand his ministry worldwide. 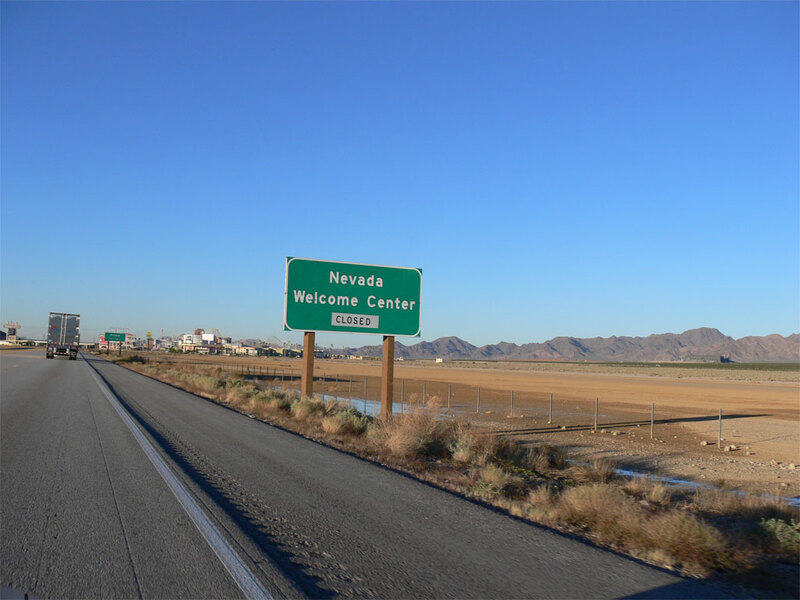 Michael said that initially Dr. McGee had only targeted the Los Angeles and Southern California area. But when the program was translated into Spanish, it took off like wildfire throughout South America. 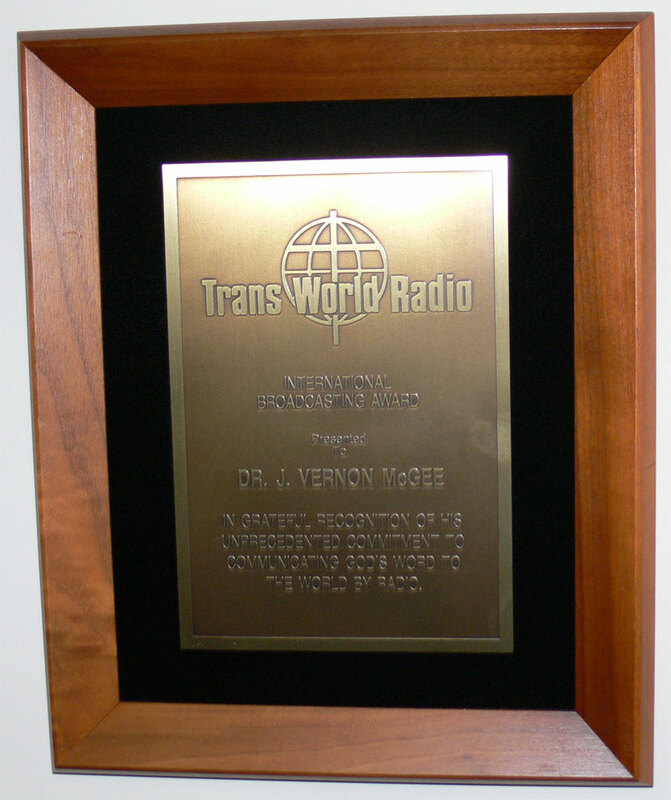 Dr. McGee was convinced of the eternal value of worldwide radio ministry. As a testament to this vision, Thru the Bible is now produced in 100 different languages around the globe on thousands of radio stations, over satellite, and via the Internet. Next, we went to the various cubicles and offices to meet the 17 different staff members. It was interesting to eavesdrop on them as they answered the telephone, asking the caller how they would like their donation to be used. Thru the Bible is the most forward-thinking organization I know of, and actually let you designate your offering towards Internet, or toward languages, or whatever part of the ministry you wish. The vast majority of the support for the worldwide ministry comes from the U.S. In fact, the president later told me that Canada is considered a missionary area, with not enough support coming in to actually pay for the radio station fees. I met Denise McCormick, who is in charge of Internet and other publications, and now deals most directly with the web site. It was her e-mail to my fellow Internet volunteer, Gene Laratonda, that let us know that we were free to publish all of Dr. McGee’s material, as long as we made absolutely no profit from it. We reproduced her e-mail online when we first took off the password protection. It was a real joy to meet her, although she made sure I wouldn’t reproduce her photo online. Next, I met two gentlemen working in the post office room. 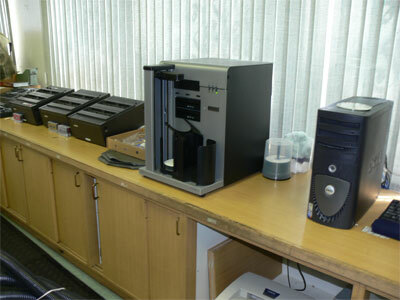 It is here where they receive the incoming cheques from donors. There are always at least two people in this room at all times for security purposes. Dr. McGee insisted on extremely sound financial practices, and I can see that they have carried this on to the present. The next person we met was Jan Simmons, who does much of the e-mail correspondence with Thru the Bible listeners. 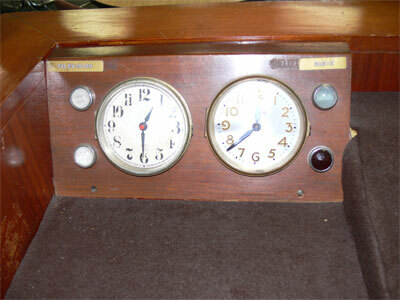 I liked the setup of her desk, which placed the correspondence on a little table immediately below her monitor. In the lunchroom, we ran into Nestor Fabian. He was overjoyed to meet me, but more about him later. 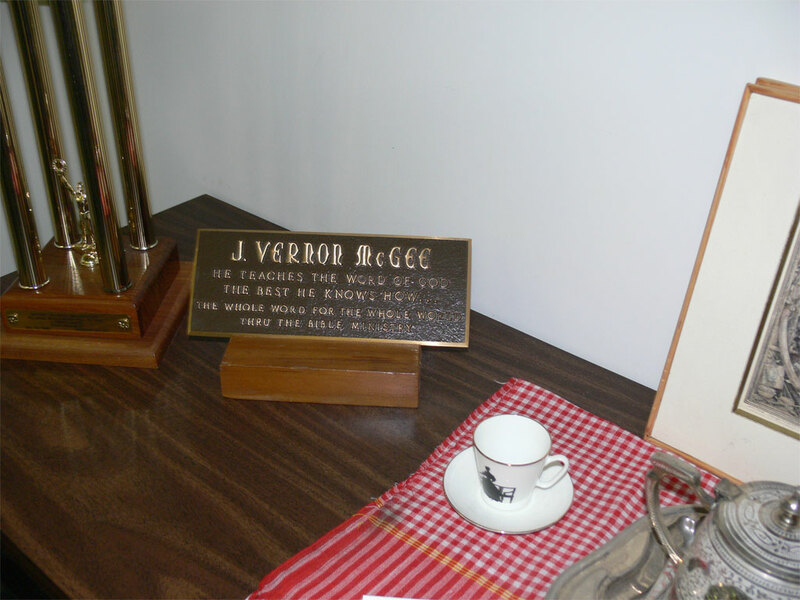 In the corner of the lunchroom was Dr. McGee’s original pulpit which he preached from at Church of the Open Door. The actual building was demolished around 1978 when the congregation voted to move because the building had become landlocked in the downtown area and the entire congregation had to drive in each Sunday. In fact, shortly after the sale, as a result of an earthquake, the building was condemned, and has since been torn down. An office tower now sits in its spot. 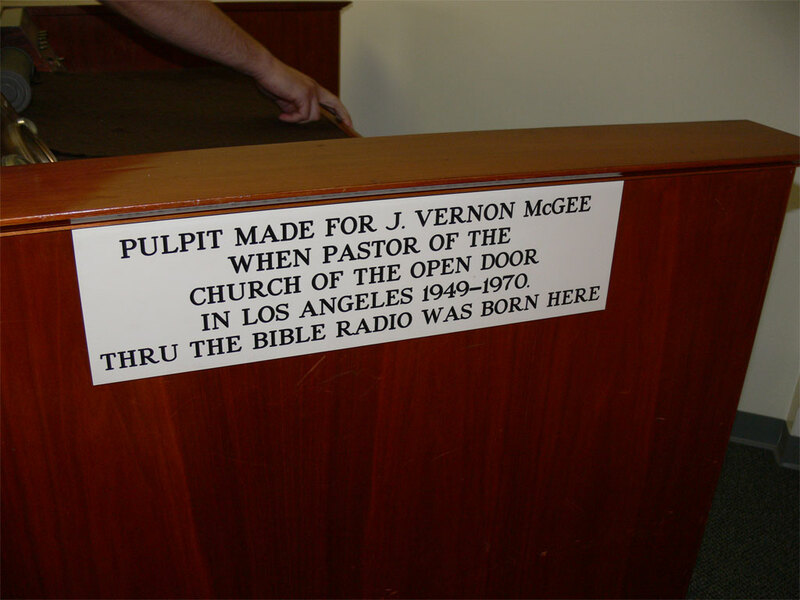 The pulpit was donated to Dr. McGee just before they tore down the building. The most striking feature of the pulpit were the words written on the back of the pulpit which would be seen by a visiting minister. 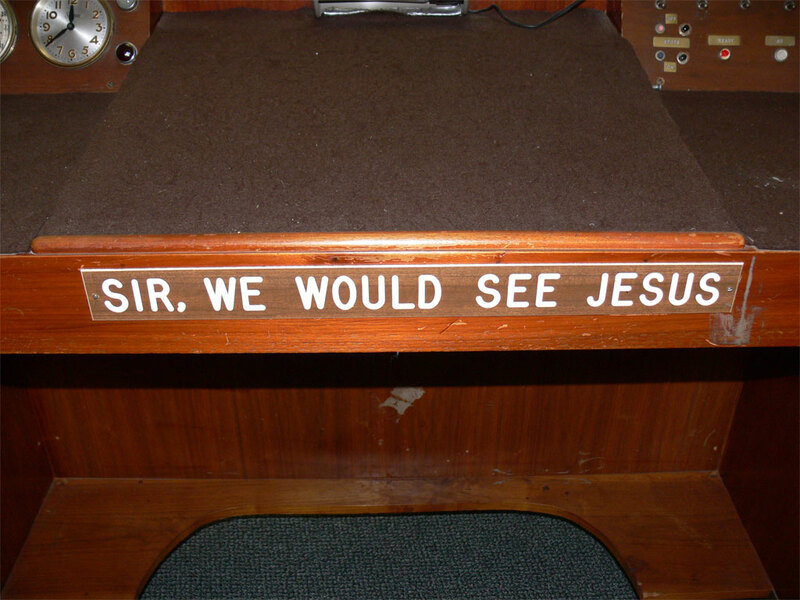 In large letters, it said, “Sir, we would see Jesus.” To the left side on the back of the pulpit are the on/off lights for radio and TV. Apparently Dr. McGee experimented with TV for a couple of months, but found the time restrictions unbearable. 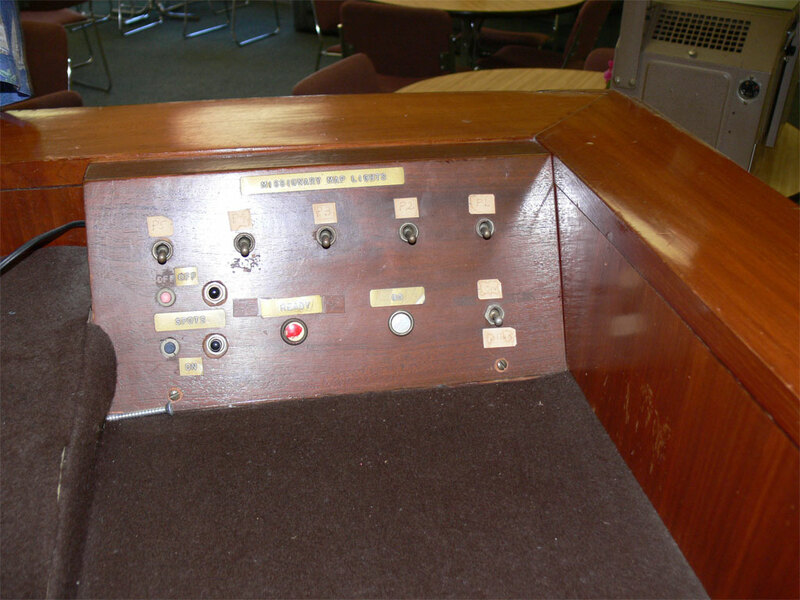 On the right-hand side were various toggle switches for overhead lighting for his many visual aids that he used while preaching. 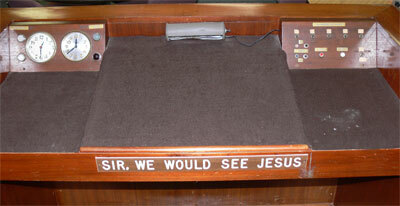 The other thing I noticed was how wide the pulpit was. He had plenty of room to lay out three or four different books besides the Bible. 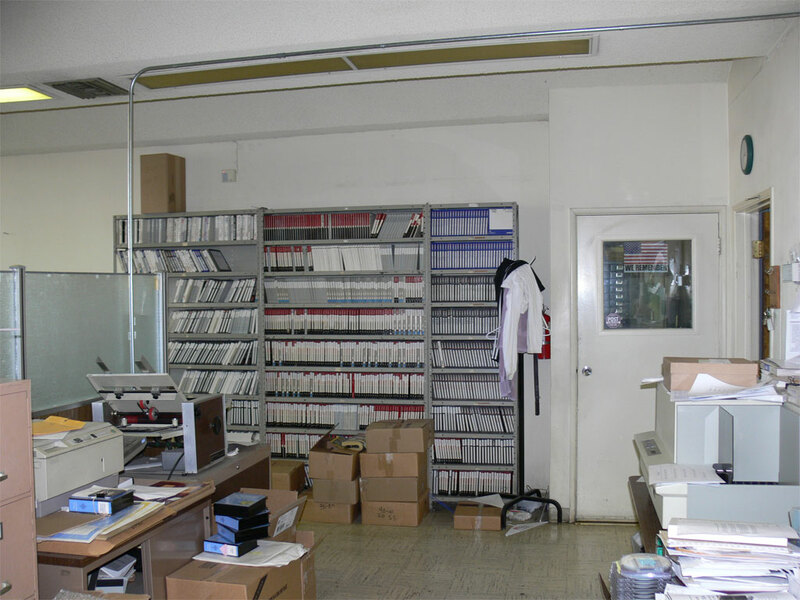 Next we went into the Reproductions Room where many of the cassettes and now CDs are reproduced. There was one computer in the corner with some audio software on it. The one thing that stood out was all the old reel-to-reel and cassette equipment that is still used. Apparently the vast majority of shipments are the 14 mp3 CDs of the entire five-year series that I had a hand in producing. 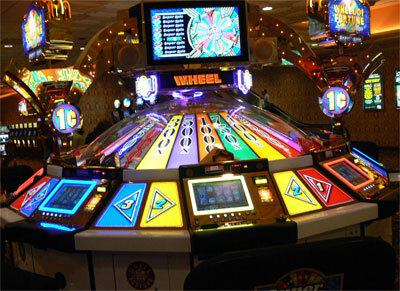 They have a CD replicating machine here where they do this in house. The audio CD series of 387 audio CDs is still done under contract with some other firm. In a small studio, we met George. Part of his job involves digitizing the Sunday Sermon archive which is stored across the road. George is a relatively new hire, in contrast to most of the staff who have been there an average of 15 years. 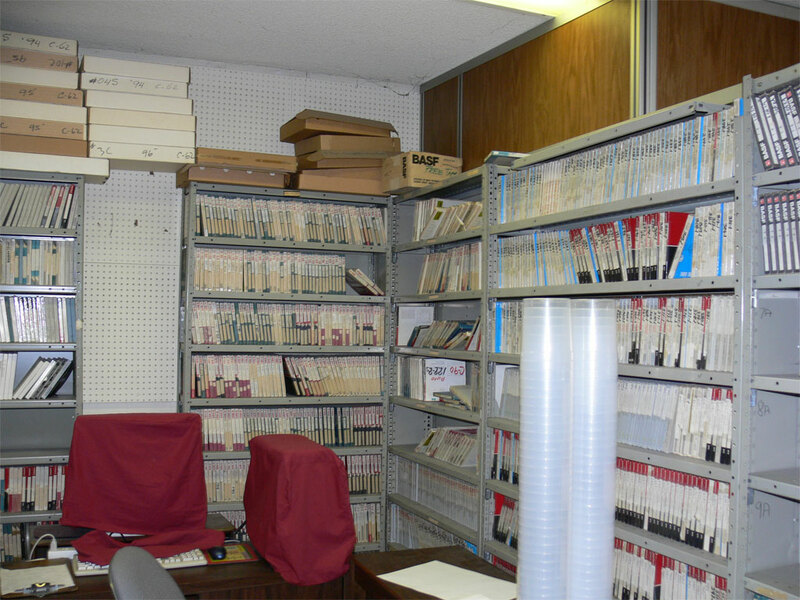 Apparently, his predecessor had done a lot of the digitizing of Dr. McGee’s archive. However, to date, less than 40% of Dr. Magee’s entire reel-to-reel archive has been converted to digital format. There is in total about 22 years’ worth of sermons, with both Sunday and evening messages archived. Here’s a project for some willing soul to work on to make this available to the masses via the Internet in years to come. We next walked into a bit larger studio where Nestor worked. 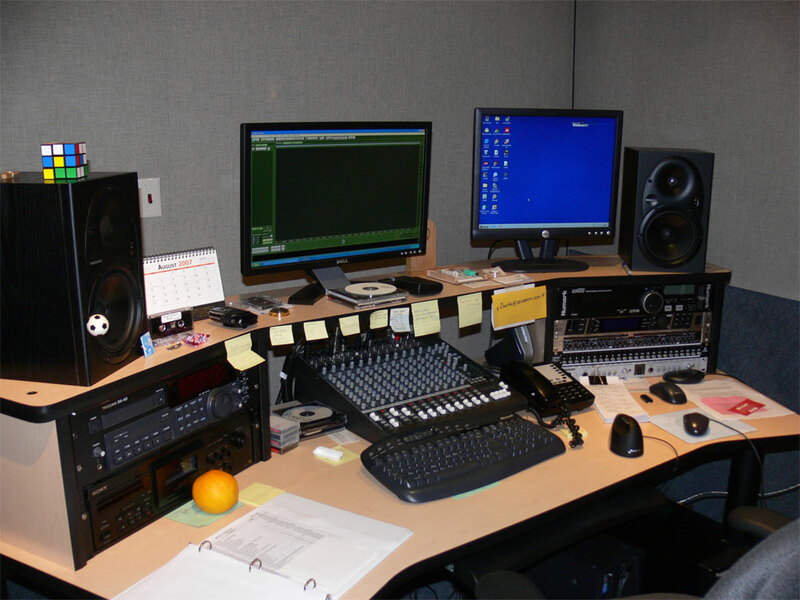 Nestor is the audio engineer for Thru the Bible, and there was a microphone in the corner, similar to the one Steve Shwetz uses. Apparently, Steve occasionally does his recordings right here at the head office. Nestor gave me a big hug and a very warm welcome. He thanked me yet again for having converted the CDs into mp3 format in good quality. Personally, I don’t think it was a matter of quality, but perseverance. It took me about two years to rip all the CDs. 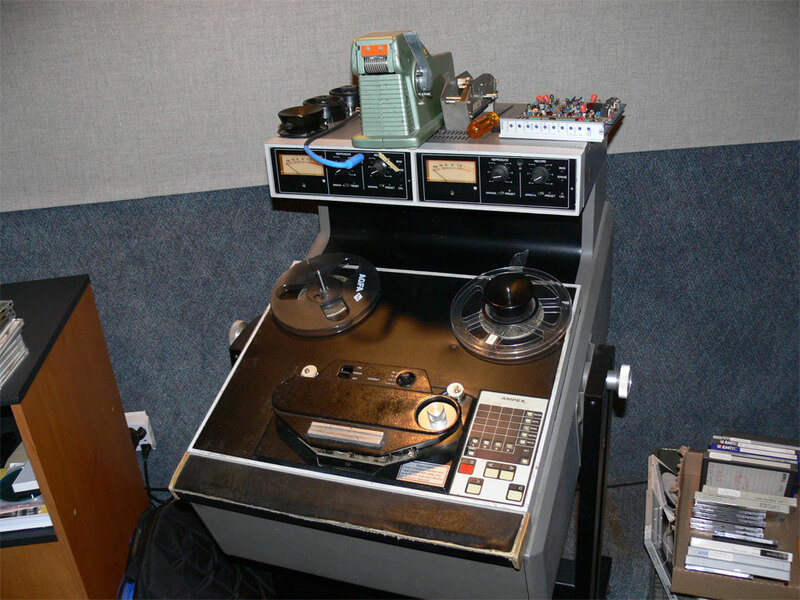 I asked them why he still had the reel-to-reel beside his desk. 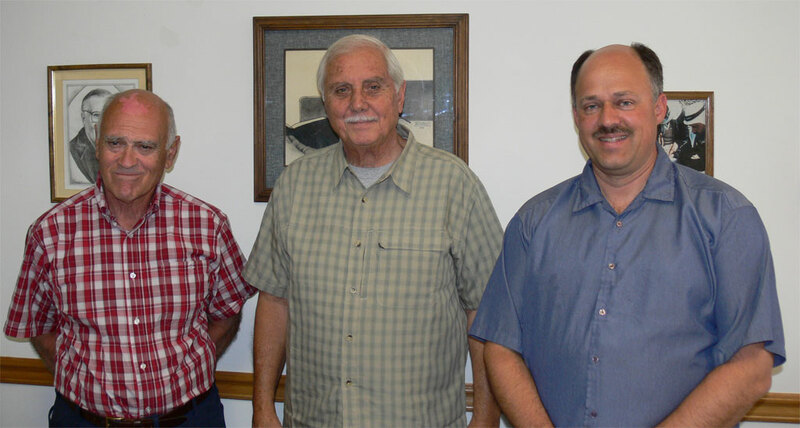 He said that they continue to convert Dr. McGee’s old Sunday Sermons to digital format, and sometimes have to go back to the original sermon if their files become corrupted. 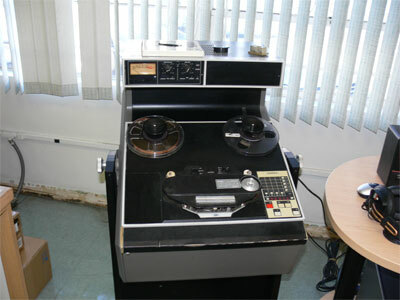 He said that the process involves first cooking the reel-to-reel, and then playing it through in real time into the computer. I thought he was joking when he said they cook the reel-to-reel. However, in order to get rid of any possible moisture, they actually put it in an IE convection oven at 150° F, and only then put it on the reel-to-reel. I noticed that Mr. Uses the Adobe Audition Software, which I will have to look into. He also has a large Storage Computer, which still runs on Windows 98. For me, his studio was the most interesting part of the tour. Next we went to the computer and post office room. Here they had an old IBM computer that houses the entire database for Thru the Bible. There are two backup computers, plus huge tape backup that happens daily. 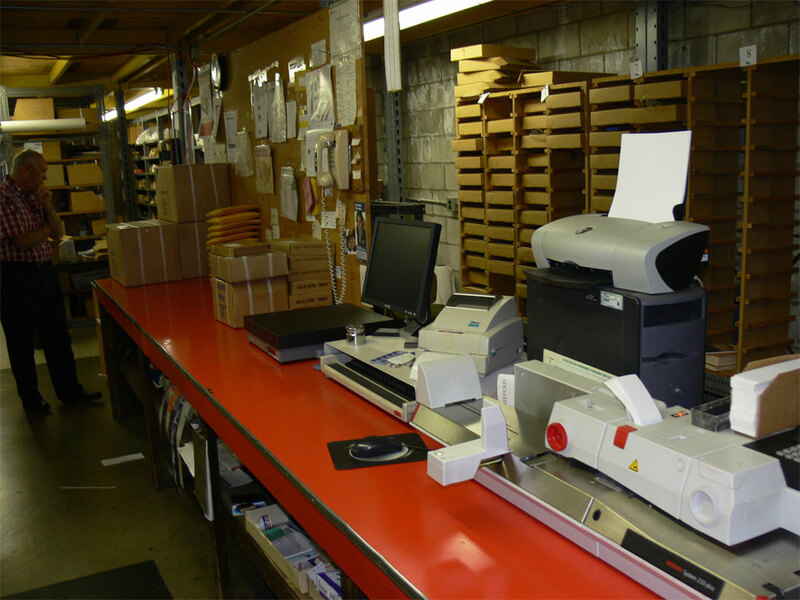 The post office was actually the shipping area where they print the labels, and cart them off to the post office. I noticed that the printer was also an ancient style, but I guess if it still works, they continue to use it here. I’ve seen financially frugal organizations before, but this one takes it to a new level! They are certainly good stewards of the donor’s money. Michael mentioned that they had another office across the road, but it was a bit messy, and I may not be interested. I guess he doesn’t know me too well, because I’m interested in everything. 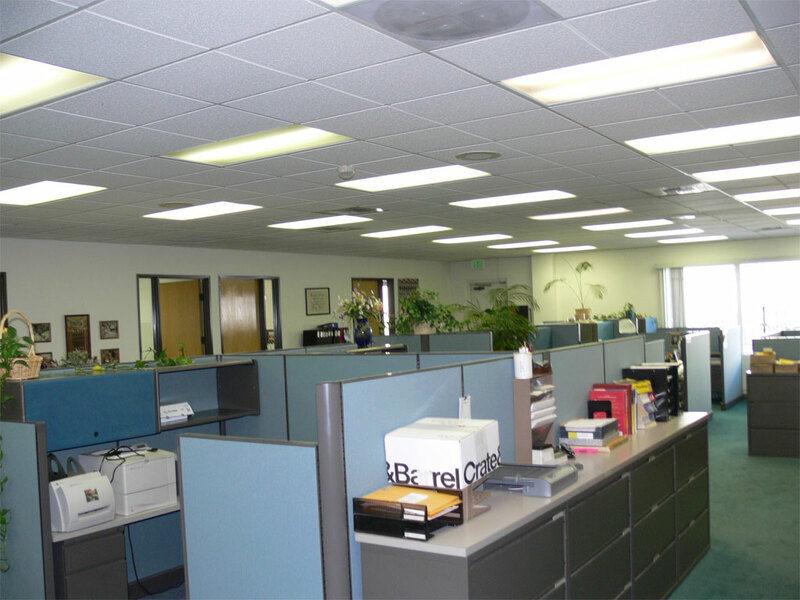 We walked about 2000 yards across the street and down a bit into a rather large office. There was no one working at the desks in the front, but the warehouse in the back was well used. There was one worker I met there who was busy filling orders from the shelves. Here again, they have the old labelling and sorting equipment. I could see many skids filled with Dr. McGee’s hardcover material, ready for shipment. Apparently, there are plans to move the office across the road into this building, and save on the property costs of two buildings. For myself, I wonder if it would become too cramped. 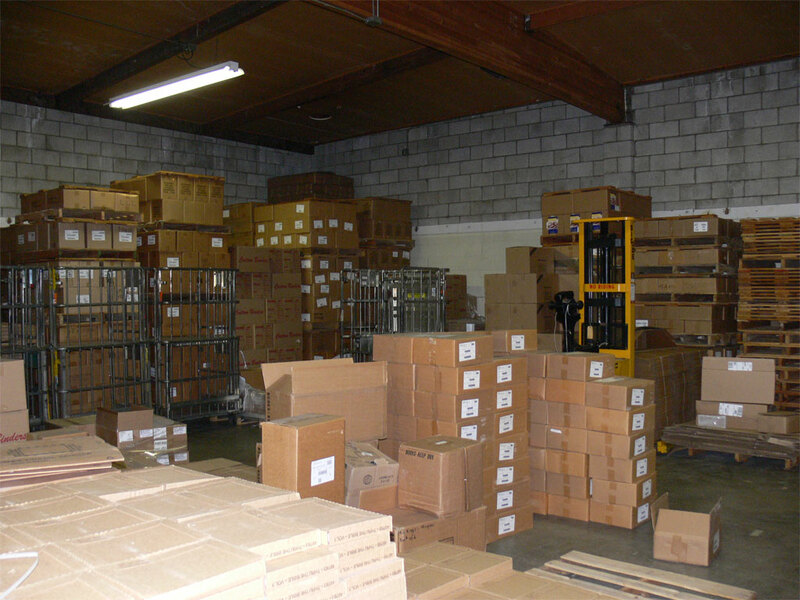 Overall, I got the impression that over the last several years, they have downsized somewhat, as new technologies make physical shipments less and less popular. Then we went back across the road for some more photos in front of the banner, and to speak to Leo Carlen. He wanted to take us out to dinner, so we all piled in to Bob Kern’s car, and drove about a mile to a very nice Italian restaurant. Over dinner, I was really impressed was Leo’s visionary thinking with respect to the future of Thru the Bible. He is a born leader, and still very much in charge. The only thing I had to laugh about was that Leo’s office was the only one in the building without a computer! But he proudly showed me his cell phone, stating that “At least I have this.” In fact, he handed me his cell phone, and I programmed my cell number into it, and he gave me number. He emphasized that he wanted to hear from me via his cell phone periodically. Not many people would give out their cell phone number. Leo wanted to hear all the possible ideas I had for furthering the ministry. First of all, he assured me that they fully intend to release both the entire Sunday Sermons and Question-and-Answer series in mp3 format on the Internet as soon as possible. This was the main thing that I had come for, and I saw that were of the same mind on this subject. We spoke about the Sunday Sermons, and I asked if I could help do the conversion from the audio CDs. Right then he set up a meeting with John, the head man in the office. As it turned out, the complete CD series is still being created. The next thing was the Question-and-Answer series. It seems he, too, wants to try to convert it into a more searchable catalogue of questions and answers. However, it appears Dr. McGee had the Question- and-Answer radio program for almost 30 years, and so the task of cataloguing it all according to topic would be huge. However, after the Sunday Sermon ministry has been published online, this will likely be TTB’s next project. I asked if we could release the text of the five-year ministry in web format (HTML) online as well. Leo also liked this, although the details were not discussed. 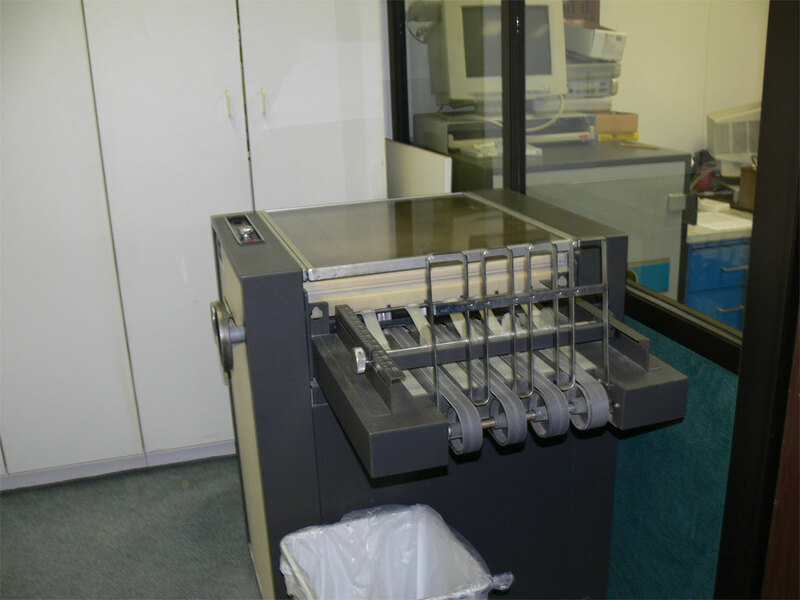 We currently have the text available on a CD-ROM, so it would not be a huge step to reproduce it online. My feeling is that people can often read faster than they can listen, and it is often a preferred media for many people. Having it in text would also make it searchable by Google. Here again, this would be a later project after the Sunday Sermons has been dealt with. Finally, we discussed the need for more exposure. We would like to have iTunes by Apple carry our mp3 material without copyright restrictions. This will have to be investigated further, but the goal is to draw attention to our ministry on a global scale. 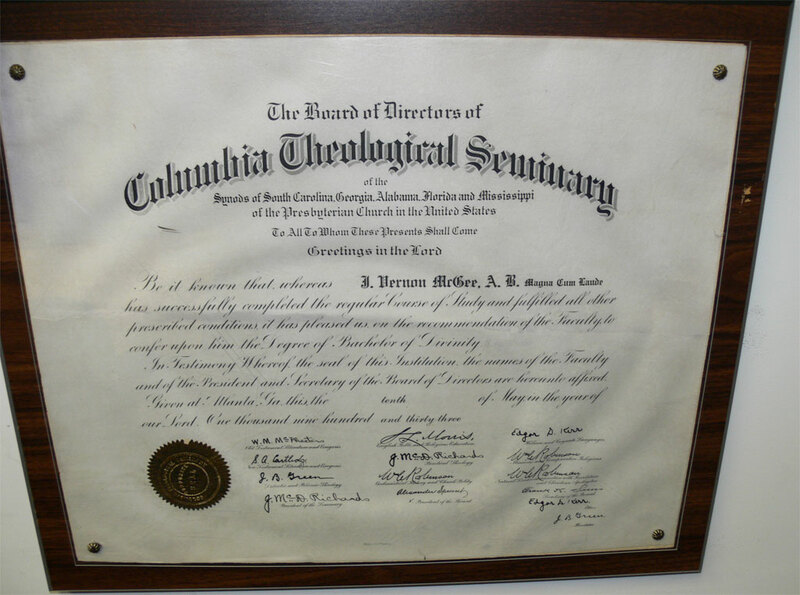 Another idea that I bounced off of Leo was having someone actively on the road as a salesman, approaching theological seminaries and large churches to sell the idea of using Dr. McGee’s material as a steady resource for Bible classes and seminaries. It is the personal approach that is lacking as we move into the Internet era. Here again, it is simply a matter of getting people’s attention. I suggested a retired salesman/Bible teacher would be the optimal person. Leo asked me to write all these ideas down in an e-mail and send them to Bob Kern. He went on to ask me what my opinion was of Americans, from a Canadian perspective. I assured him that I often found Americans lacking in global awareness. I also said that I had been surprised with the culture of California which incorporated so many Mexican workers in the Manual labour-type of jobs. It seemed to me that this was almost the same type of class system that existed centuries ago with the black people. However, now the Mexicans are being paid. However, I did not see one white person working as a cleaner in our hotels or on the many farms that we passed. It seems all the service jobs belong to the Mexicans. 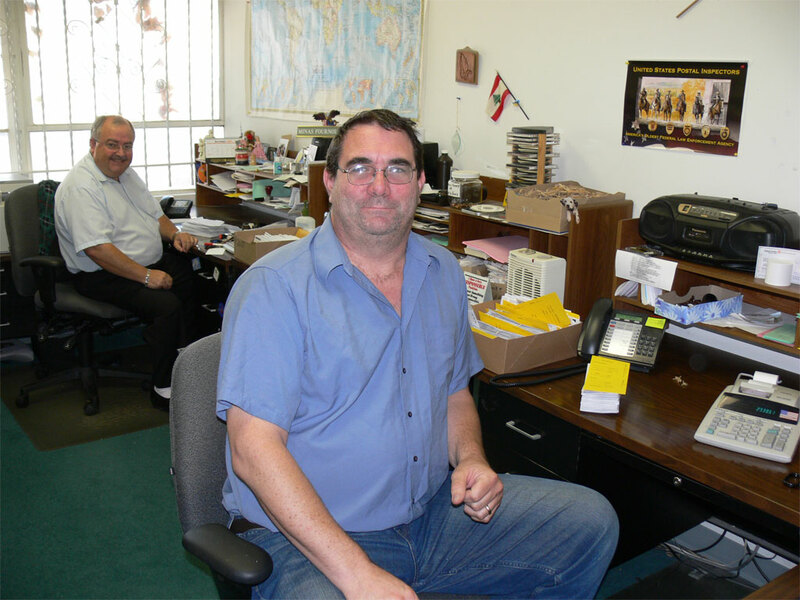 Steve Shwetz said that his entire workforce was Hispanic. I explained that in Canada, we have Toronto, one of the most diverse cities in the world, but there is no caste system of any sort. White people do every level of employment. Leo said that the economy would collapse in a year without the Mexicans, but that he also was concerned with this social trend in the United States. We went back to the office where Leo immediately set up a board meeting with John K. It was a very productive meeting. John agreed to ship the entire five-year set of Sunday Sermons CDs to me when they're ready. We agreed that 32 kilo bits per second (kbps) would be the standard, and that he would try to expedite this project. He also asked me to do the Question-and-Answer series sometime in the future, which I agreed to. There was an ongoing discussion on how to arrange a Question-and-Answer series. I came away with an incredible sense that my prayers have been answered. I then said good bye to Leo and Bob Kern, and had a parting conversation with Michael. He volunteered to mail the DVD of photos I had taken to my mother, so I wouldn't have to look for a post office. We left the office around 3:00 and drove towards Las Vegas, with the intention of turning north towards Death Valley. I was able to use Microsoft Streets and Trips to look up the hotels in the area we were heading to. I double-clicked on the motel icon, and got the exact address and phone number. 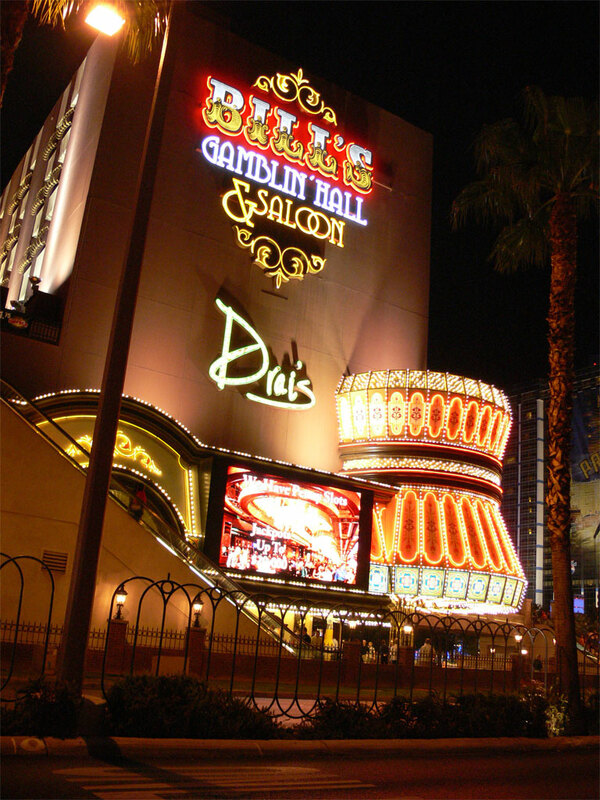 I then used my cell phone to call ahead and make reservations. It turned out the entire park of Death Valley was completely full. 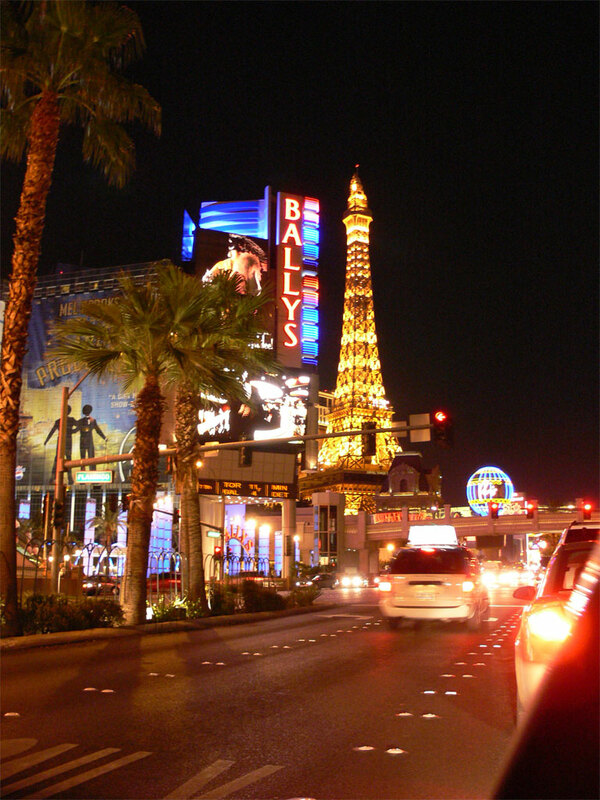 And so we changed our plans and stayed overnight in Las Vegas. 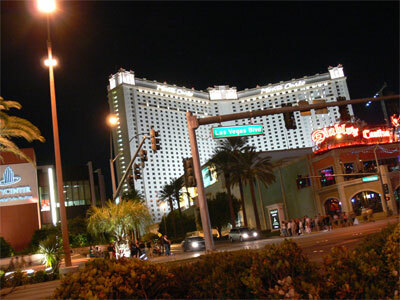 Ron said this was actually for the better, as Las Vegas is best viewed at night with all its lights. 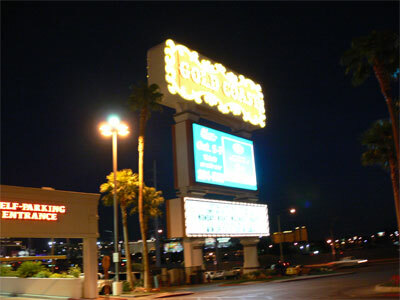 I then called ahead to Las Vegas and made a reservation at the Extended Stay Motel. We arrived in Las Vegas around 6:30 and booked in. 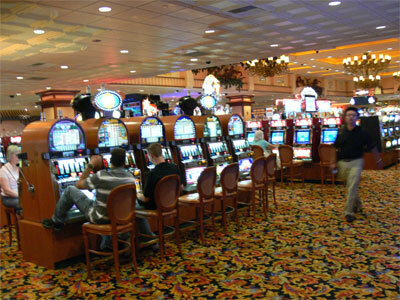 The motel lady said that the Gold Coast Casino was the best buffet in the area, so we headed over there. It turns out the price was reasonable, and the selection amazing. 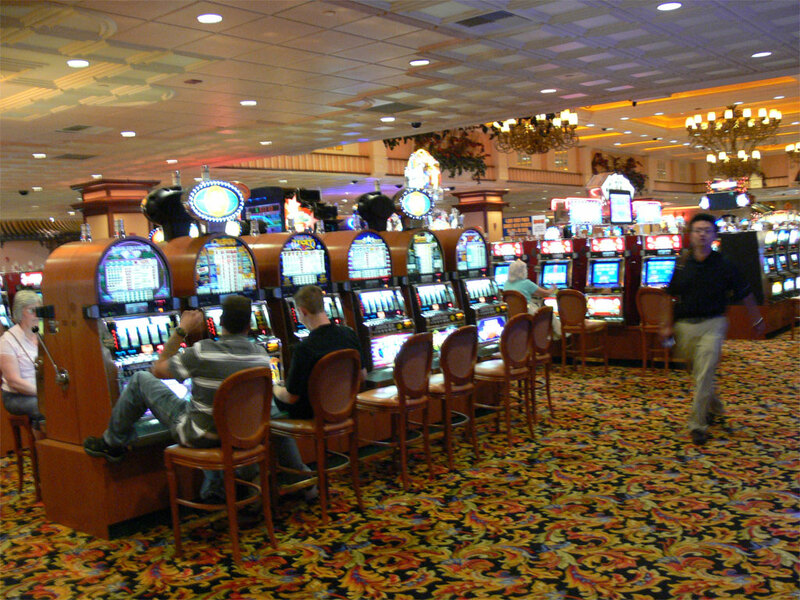 We also found out that all parking in Las Vegas is free, as they want you to park in their underground parking and then gamble and their casino. 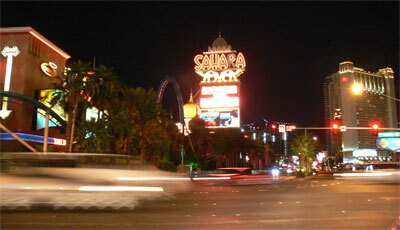 After supper, around 8:00, we drove up and down the strip a couple times to gawk at all very lights. I must say, Americans go in for the huge signs. Most of it was quite beautiful, but there were a few tacky signs as well. The scale of the signs was amazing, with one of the 20-storey apartment buildings being wrapped in one huge sign. It was the type of rap that they put on the sides of buses, but this sign covered at least 10 stories of that building. There were miniature replicas of the Eiffel tower, a CN-type tower, a circus, and Treasure Island. Double-decker buses for public transit were everywhere. 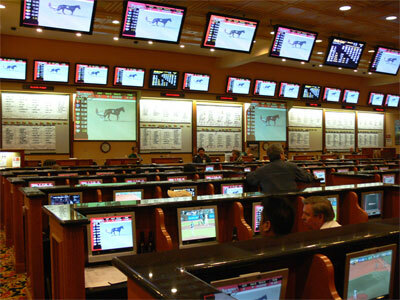 The one thing that stood out was the multitude of gigantic TV screens. 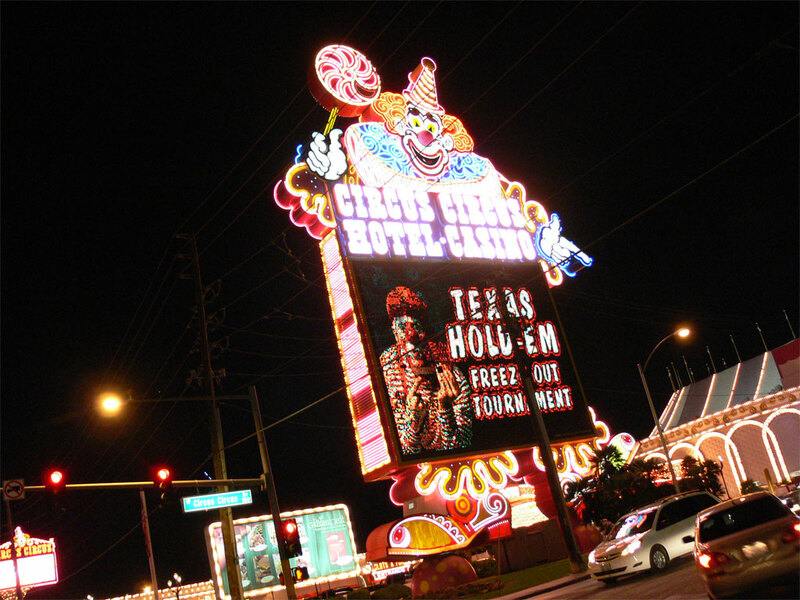 About every second building had a moving coloured sign in front, rather than the typical plastic sign lit up. 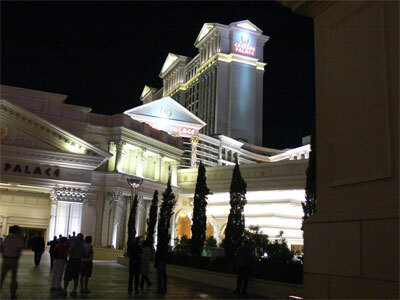 We decided to park near Caesar’s palace, as it apparently was one of the biggest casinos. I ended up taking the wrong driveway, and ended up in the hotel right next door, called The Bellagio. 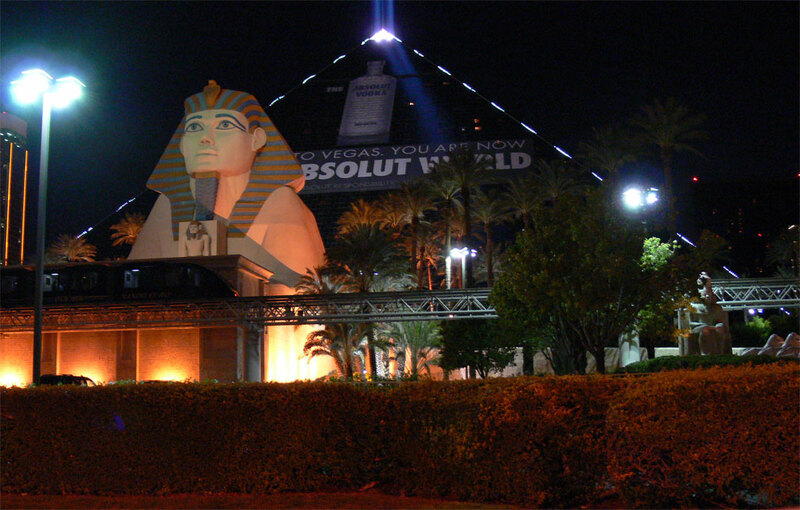 As it turned out, this hotel was well worth seeing. They had a huge Thanksgiving display in the lobby. There was a walkway over head where a solid hoop of water flowed. It looked like it was made out of a metal rod, but it was actually high pressure water. It shot up from one side of the walkway, over your head, and disappeared into a hole on the other side. There was no sound of splashing, and there was no water flying anywhere. You hesitated walking under, because you figured you would get splashed. But apparently it was a highly directional stream, and looked like plastic up close. The next second, it disappeared without a splash. 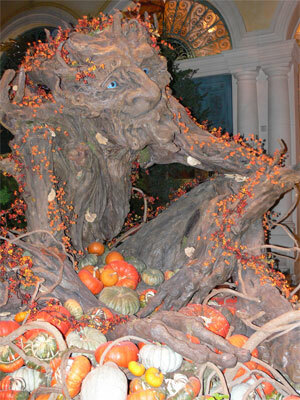 They also had an interesting sculpture of a mythical live tree, holding all kinds of pumpkins, and the lobby had huge glass flowers on the ceiling. 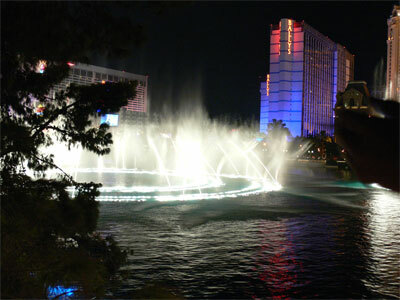 We walked outside the door, and came across to a man-made lake with a fountain and music show. 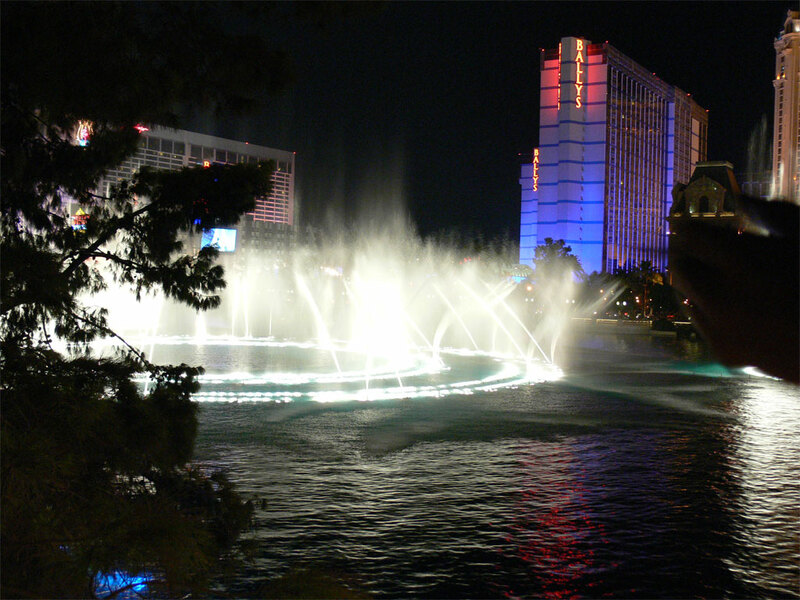 A fountain shot 100 feet in the year, swirled around, and multicoloured lights shone, all to the sound of music. We watched for a few moments, and then moved on, as our goal was the building next door. 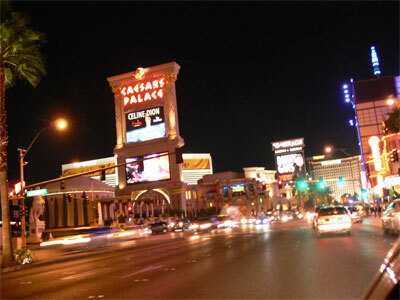 In order to get to Caesar’s palace, we had to go up and over a walkway, as this intersection was too busy for pedestrian traffic. 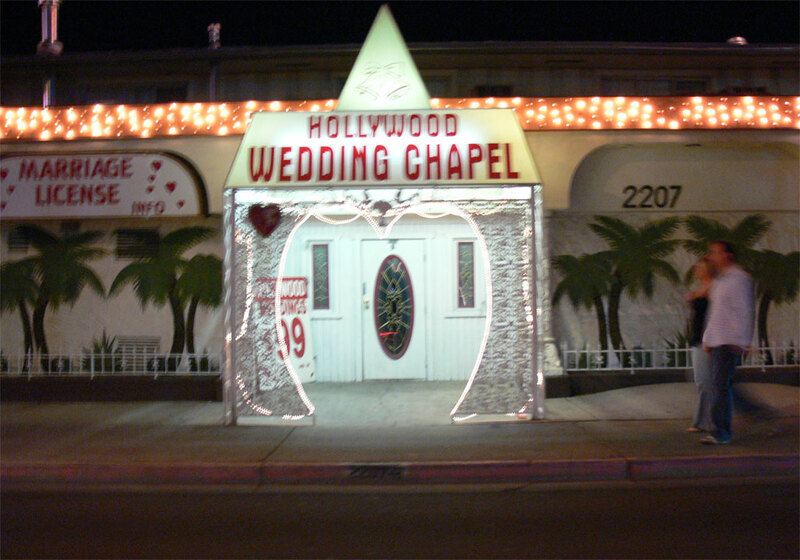 We walked in, and pretended we might be interested in staying there the next night. I believe it was around $250 for a basic room. The attendant gave us a lovely map of the complex. We proceeded out the back door towards the Greek fountain. It was now dark, and not easy to take photos. 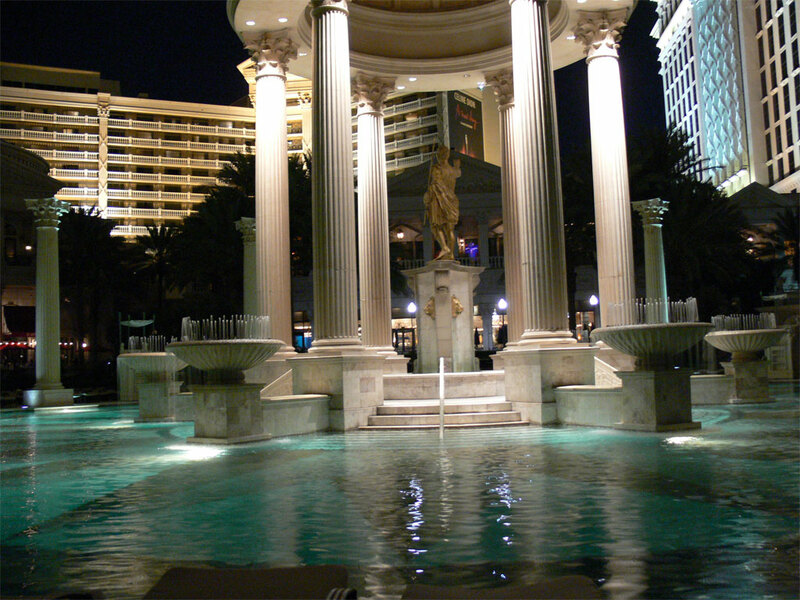 They have a statue of Julius Caesar in the middle of the fountain. The buildings were about 30-stories tall, and had classical artwork all around. However, I didn’t see the gaudy neon flashing lights motif often associated with casinos. 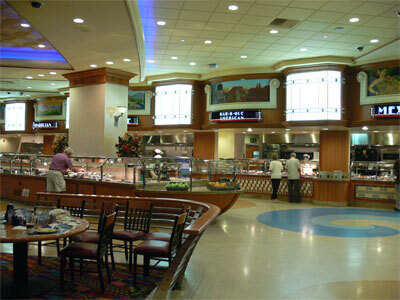 Apparently, a lot of pop-name music stars come to play here, and they tend to cater to the upper crust. 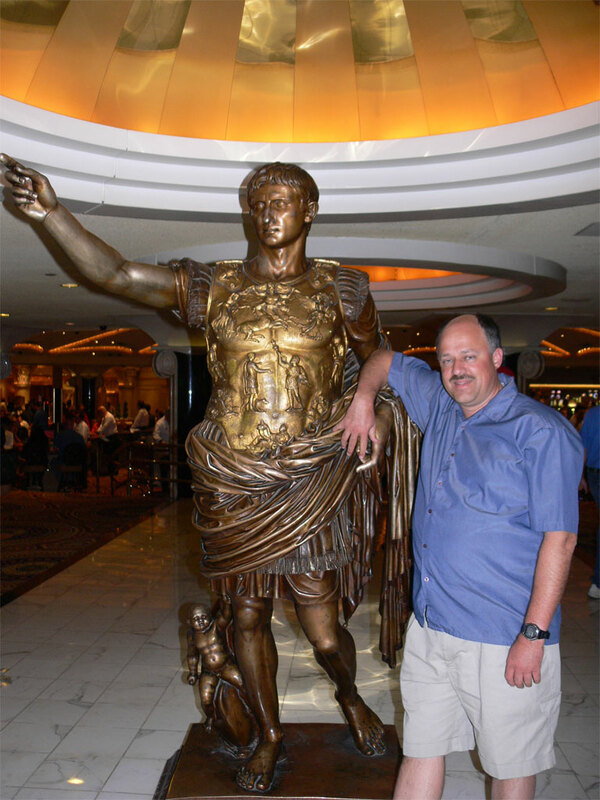 As we exited the front door, a fellow offered to take my picture beside another statue of Caesar. After he had snapped a couple pictures, with my camera, I thanked him and we left. Ronald told me that he appeared to be drunk, which, had I noticed, I would have declined. We again walked across the front by the manmade lake, fighting crowds the whole way. 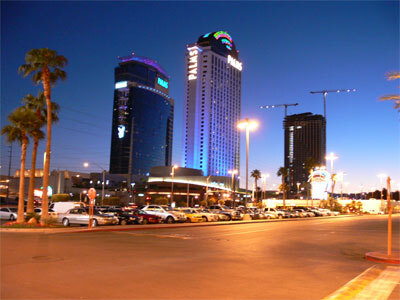 This is a city that comes awake when the sun goes down. The sheer numbers of tourists in this area is amazing. Right next-door to where we had parked, they were building a five-skyscraper complex for another casino, I presume. I noticed that the construction workers were working right into the night, and I figure construction carries on 24 hours a day here. By the time we got back to our car, it was almost 10:00, and we were glad to be going home. While it was certainly interesting to see, I kept getting that sucking feeling on my wallet here. It was time to move on. We traveled 425 kilometres today.